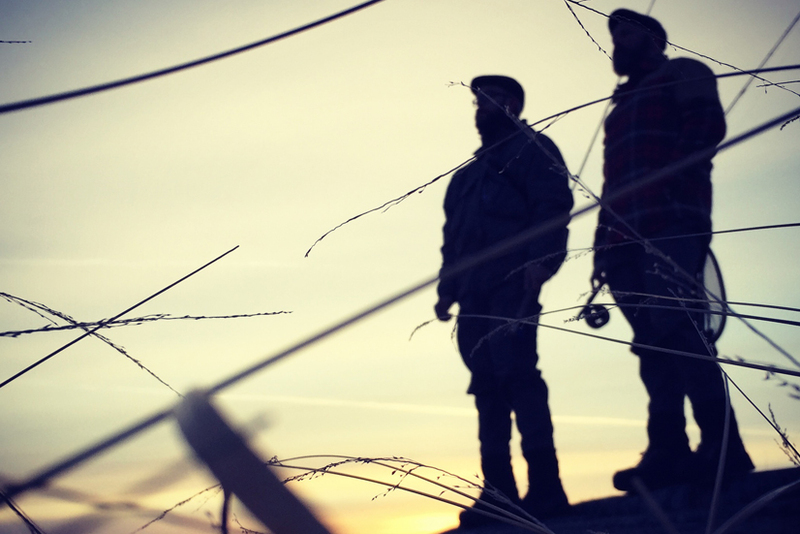 Last saturday Westler and Hermansson took a day trip to the south of Sweden. We have been there a couple of times since their season opening in January but so far we never had any good fishing. 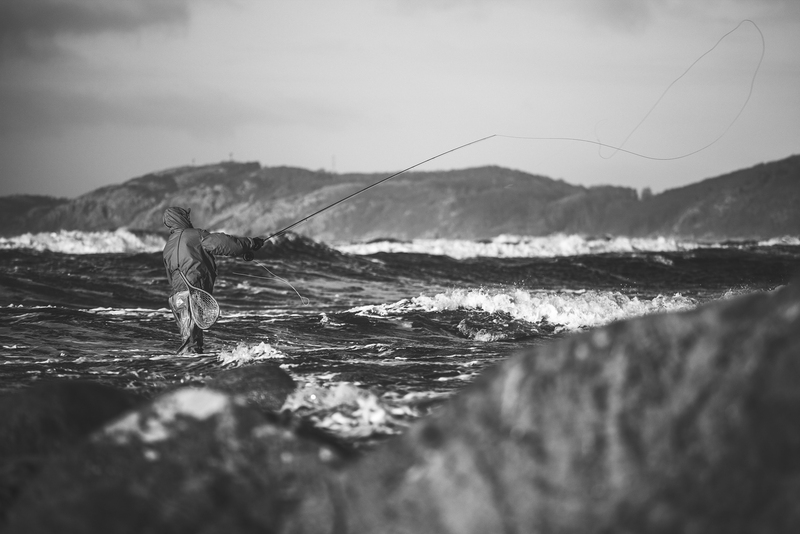 Strong winds, rain or fog use to do their best to ruin our fishing. But not this time. 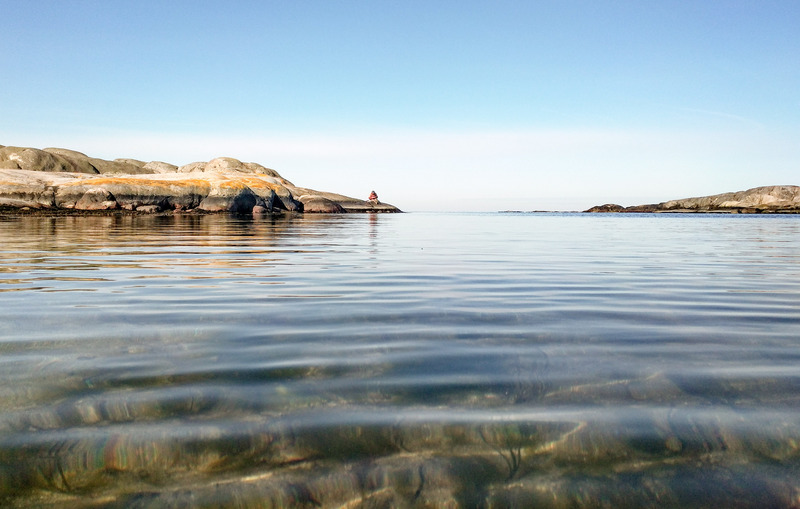 The sea was calm and the sun was slowly warming up the cold and crystal clear water. Westler rigged his newly built 8 foot, 4 weight and Hermansson went with the more appropriate 6 weight. 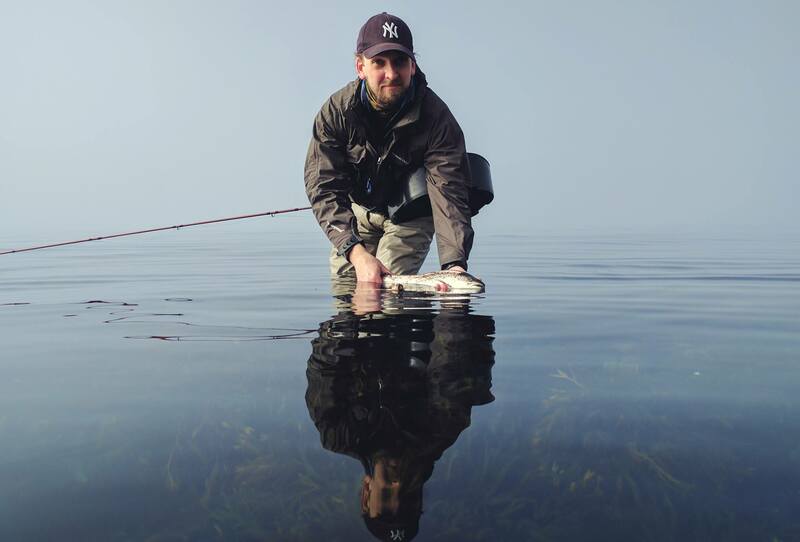 We fished an area with sand bottom and a lot of rocks and kelp but the calm and clear water made it impossible not to spook the fish, if there were any. The next spot was near the harbour in Mölle. A thick sea mist surprised us but only lasted for an hour. 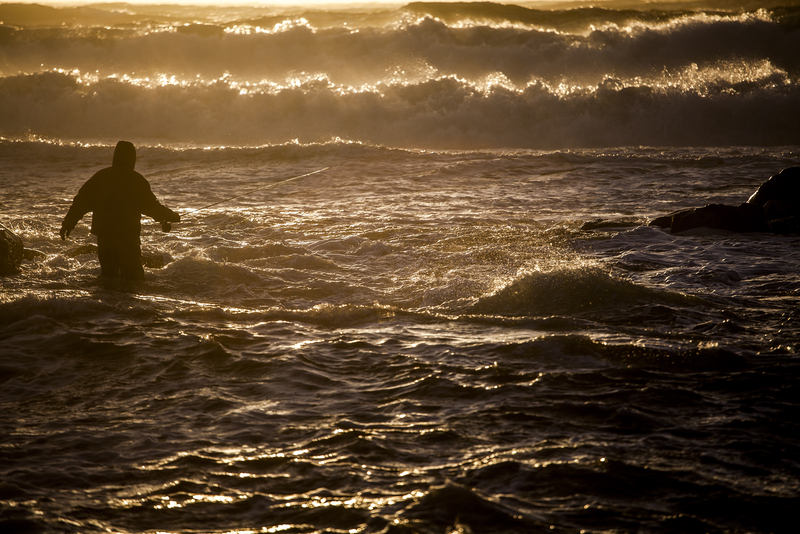 Just before the fog lifts Hermansson shouts -”There it is!” The rod was bending deep as the sun started to shine through. The 45 cm silver sea run put up a really good fight before it was released. As the wind increased Westler switched to the more suitable 6 weight. And maybe that was a good thing. Moments later he saw a big shadow following his small pink hackled fly. He stops retrieving for a few seconds and then, BAM! A giant silver trout took the fly, made some powerful rolls and then made a full speed 30 meter run before Westler could slow it down. The screaming Hardy Marquis echoed between the hills in the background. This fish was so strong that we could only steer it a bit and after a good 20 minutes we could land it in the net. Well, at least half the fish as the net was way too small. The fish measured 77 cm and just under 4 kilos. A new personal best for Westler that is not easy to break. 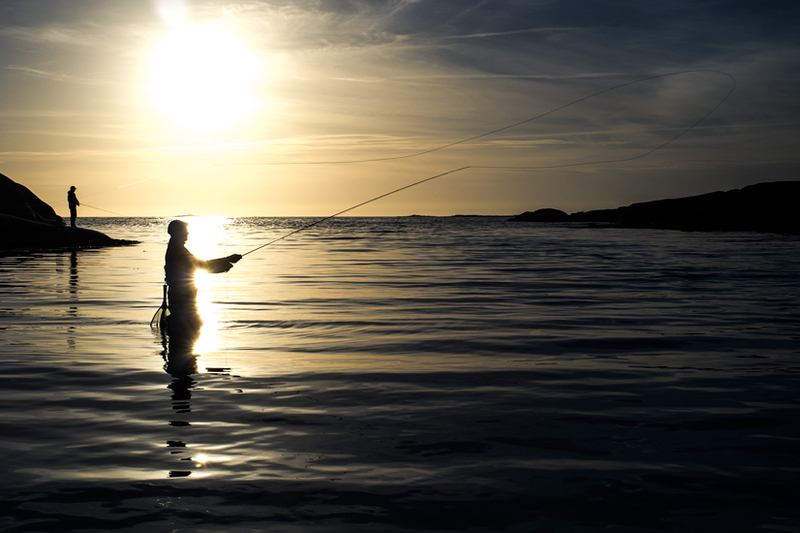 After that we had a good time in the sun with some smaller fish on the hook and a nice lunch at Hotel Kullaberg. We both smiled in the car all the way back to Gothenburg. Not all fishing trips are like this one. 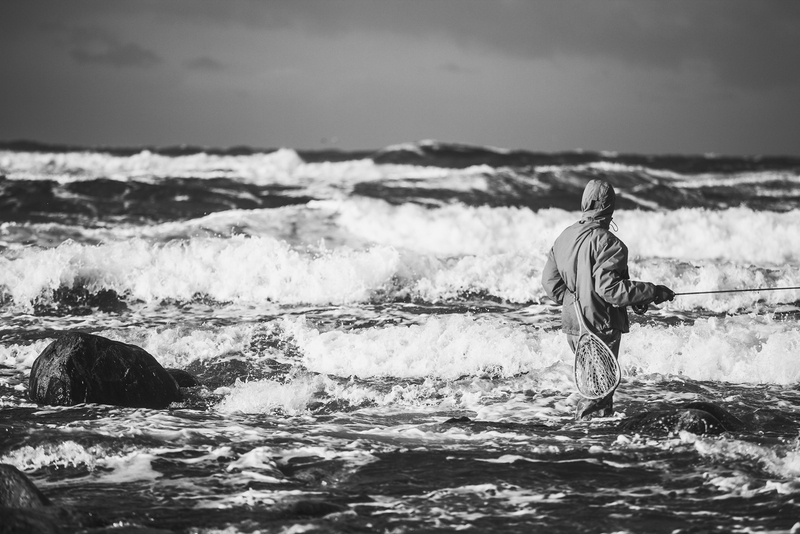 In first of april the season opens for our home waters in the west coast of Sweden. We are in the middle of preparation for a opening weekend in the archipelago just north of Gothenburg. Hopefully we can write something similar about that trip as well. Well, the season finally came to an end. As all good things have to. But this time it was different. You know the feeling when you have reached a goal, performed well, accomplished a goal. That feeling. This season we met a lot of new friends, we went to a lot of nice places, learned tons of new tactics and techniques. And we caught hundreds of trouts. Really. 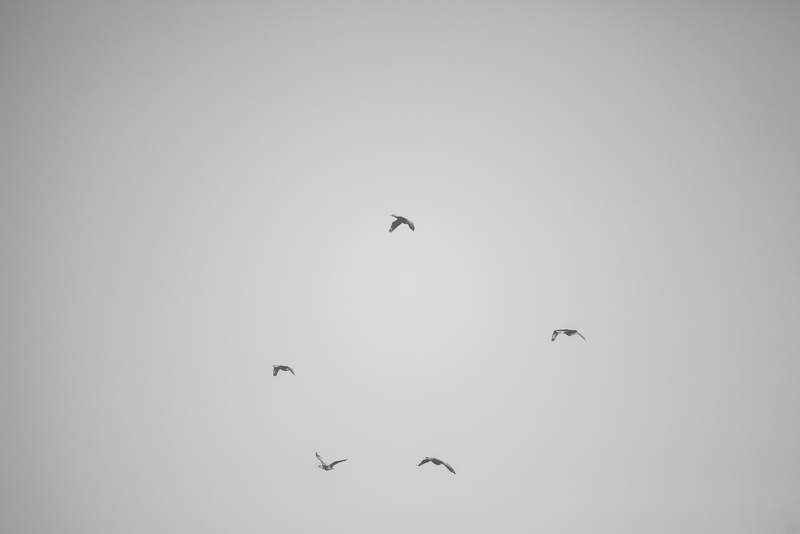 So when we sat there in the car, heading home after this season’s last sea trout fishing day, we were smiling. Satisfied. It probably won’t last long, but that’s the way it felt. Next up is a weekend trip to Öland, south east of Sweden. 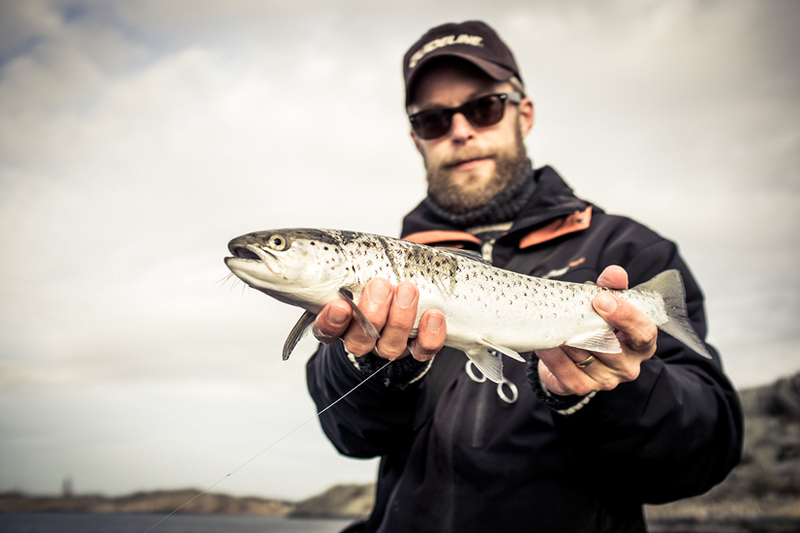 The trout around Öland is bigger than on the west coast so we are all in for a new personal best. We will try to post some updates from there. Stay tuned. 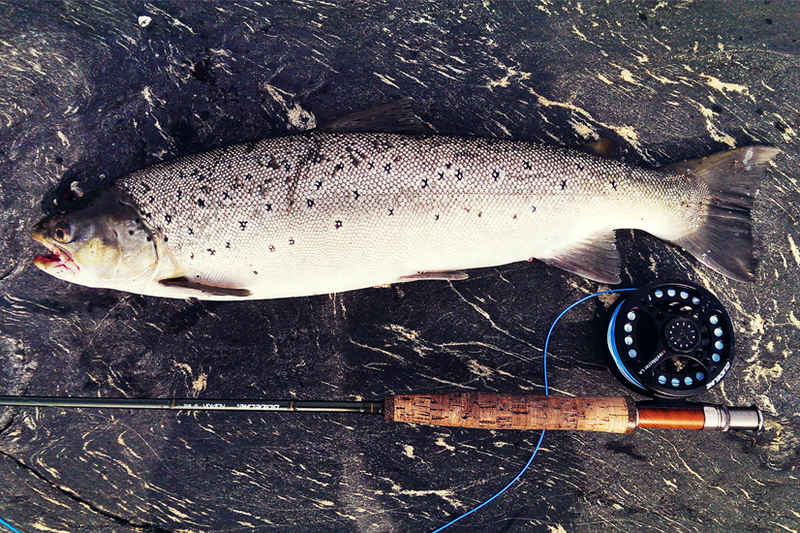 Orrbeck just got home from skiing in the northern part of Sweden and was eager to cast the line again. Really eager. That’s why we practically were alone on the early ferry to the outer archipelago. The sun hadn’t reached the eastern horizon as we assembled our gear and started walking towards one of our favourite spots. The calm and clear water made it hard not to spook the fish. With gentle steps we waded out in the narrow channel. It didn’t take long before the rising trouts started to show. And then it begun. One hour of constant wakes. We’ve never seen so much fish in this water before. As Westler started to catch his first two, Orrbeck was still struggling with the choice of fly. When Westler catched his fifth Orrbeck finally hooked a nice trout. A real high jumper. The third jump finally released it from the hook and even though Orrbeck didn’t catch any trouts this morning it sure was worth the early trip. Westler ended up with nine fine trouts with a top result of 55 cm. A couple of hours later it was all over. 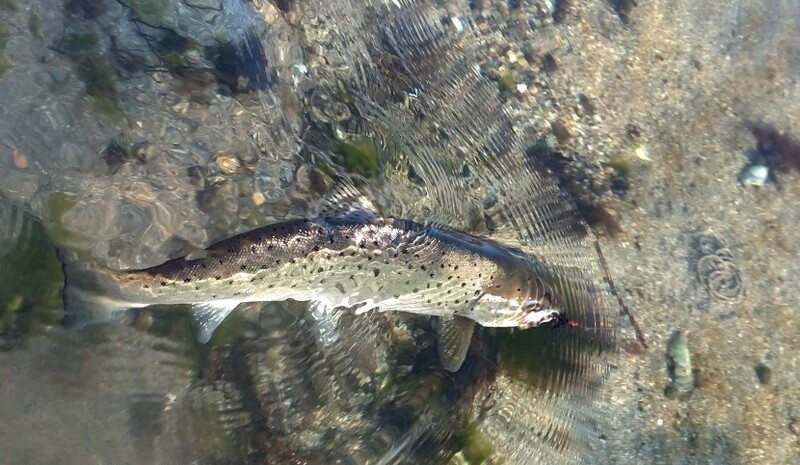 The tide made it’s way out in the ocean again, and so did the trouts. Finally. The wait is over. A new season of chasing silver has begun. It has been six tough months of fly tying, put-n’-take fishing, planning and anxiety. The first of April is no day for jokes. 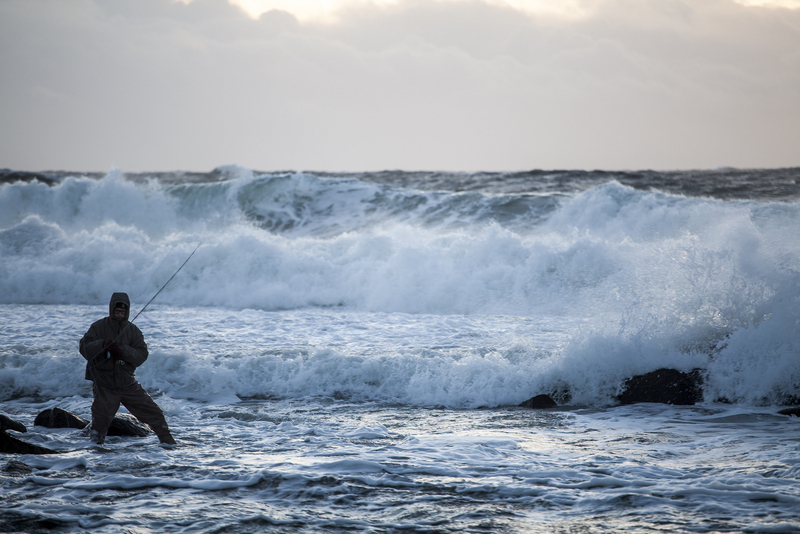 At least not for sea trout fishermen along the west coast of Sweden. For us it is a holy day. It creates the same anticipation as Christmas eve. This year was no different. 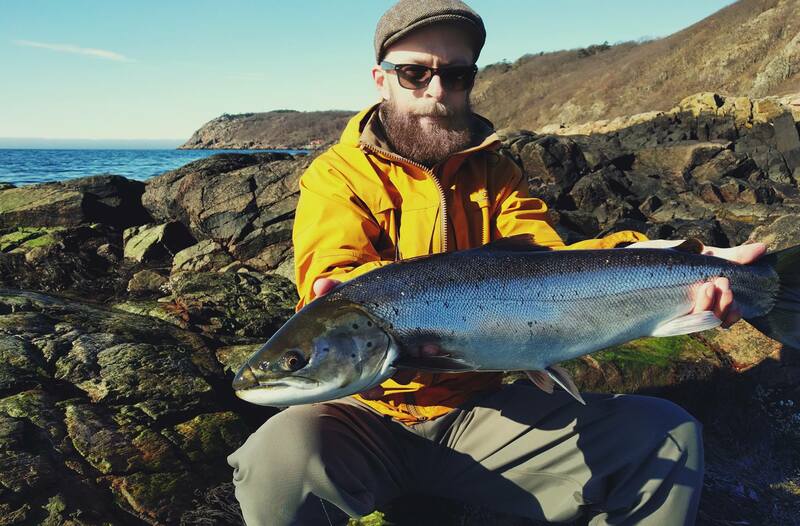 The spring came a little early so the water was around 5° Celcius and the sea trout were already feasting on worms, shrimp and small fish. We had a feeling this would be a great season opening. The fly box was packed with marabou shrimp and zonker streamers. Westler met up with some old fishing friends at an old gas station just north of Gothenburg. Somehow Orrbeck managed to book a skiing trip and therefore missed the grand opening. The sky was clear blue. 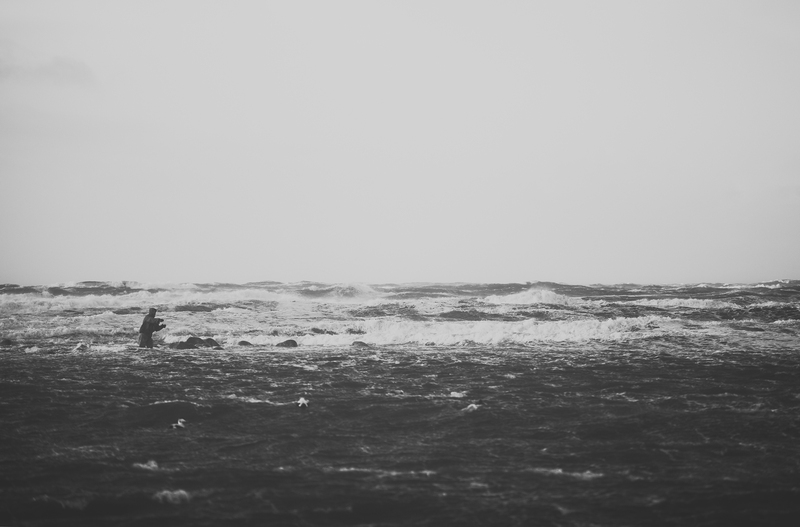 When we arrived at the fishing spot a strong wind blew in from the sea. The water was high. Good conditions. But not that good fishing. After a whole day of struggling Westler caught three and the rest of the party got a couple as well. But who’s counting? We grilled the sausages, drank the beer and had our coffee. And we told the same fishing stories as the year before. That is what the first of April is really about. The season is open. The hunt is on. For six long months. 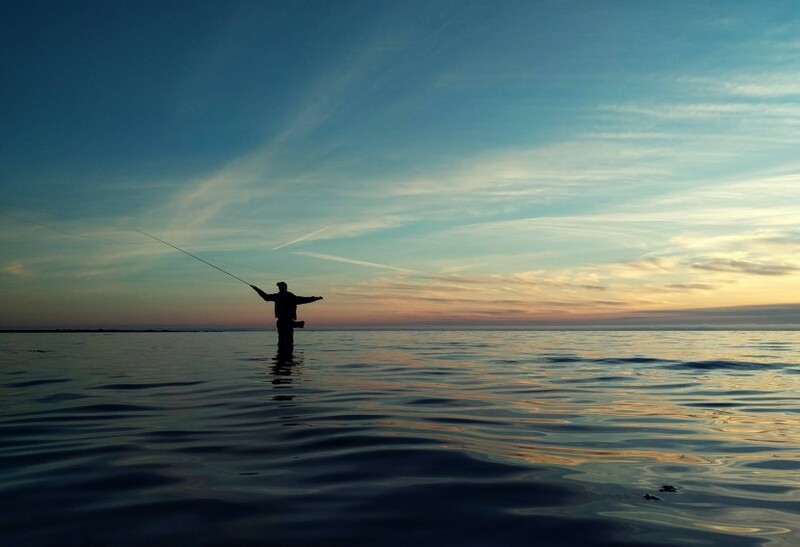 When you plan a fishing trip in advance and mark the days in the calendar, you probably don’t have a clue what the weather will be like. Sometimes it’s nice, sometimes it’s not. And sometimes there’s a storm. This was our third trip to Lerhamn. Or the fourth. Either way, we had never caught fish in this place. But it looks and feels really good so we ended up here again. Orrbeck & Westler, featuring Zlatan. And again we catch nothing. Zero. Not even Zlatan scored here. Usually when you catch nothing you try to come up with a cause. This time it was the wind. Obviously. All the other parameters were fine. 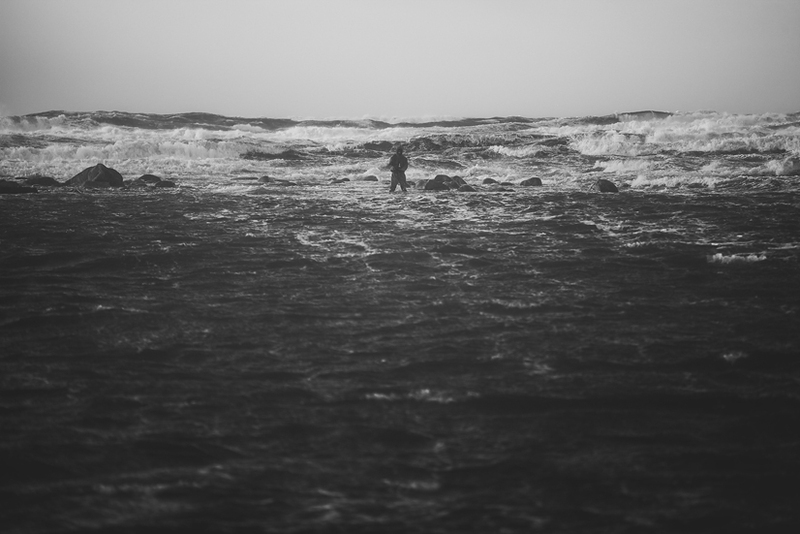 With some hesitation we waded out in the rough sea. Luckily the waves were breaking by the shallow bank just outside of the stone shore. But it surely wasn’t a walk in the park. And when we once in a while made a decent cast, a wave flushed the line on to land. The few casts we made that could have resulted in a fish got caught in all the drifting seaweeds. Marabougrisen will have to wait for it’s glory. It started out as a really lousy trip. We had until lunch to fish so we started early. The sun would rise at 06:30 so Zlatan and Westler got on the ferry to Öckerö at 06:10. Öckerö is in the northern archipelago of Göteborg and they had spotted some nice places there on the map. At first the place on the west side of the island was completely dead. But when the sun started to warm up the sea we could see some activity. Zlatan had a nice mackerel on his white shrimp imitation but lost it after a short fight. Westler had a couple of strikes on his silver streamer. But then Zlatan drops his bag of flies in the water and tries to reach for it. A bad idea on slippery rocks. After Westler managed to pull him out of the sea Zlatan decided to go home for some dry clothes. And so we changed place. Westler drove ahead to Lilleby, just out of Göteborg. It is a popular beach on the west side of Hisingen. 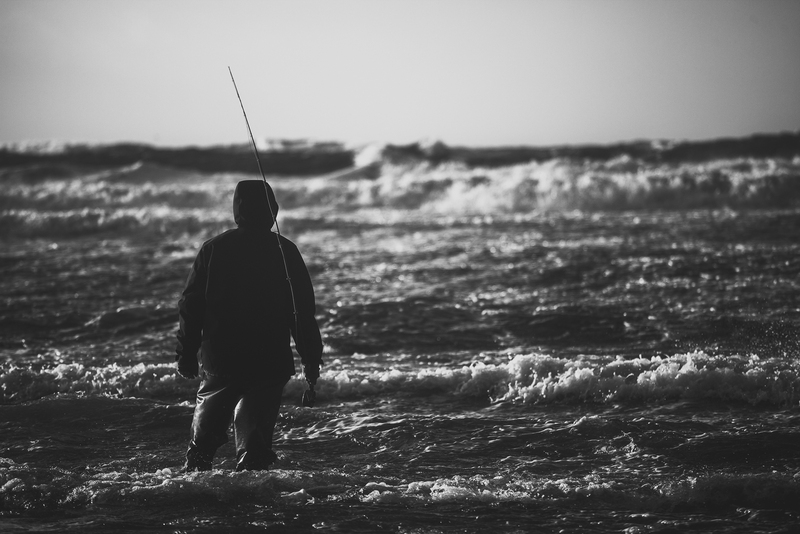 He put on a grey and white wooly bugger on a fast intermediate line and waded out from the beach. No activity on the surface and no strikes on the fly. Half an hour goes by and Westler moves slowly around a small cape with some current around it. And then… BAM! It feels like someone tries to rip the rod out of his hands. The fish runs deep and the reel is screaming. After about two minutes the fish makes a powerful jump and shows itself. This is by far a new PB for Westler. 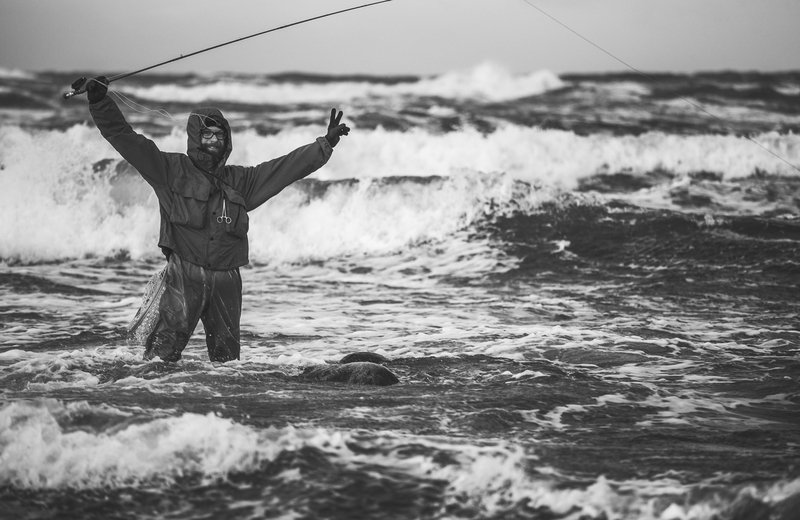 He manages to keep calm and after a 15 minutes of intense fighting and four or five spectacular jumps he landed a seatrout that measured 61 centimeters and weighed 2200 grams. Westler just broke the 50 and 60 cm barrier in one catch. Just outside a family beach in Göteborg. Tiden flyger iväg. Sommaren dundrar på i oförskämd takt. Juni ägnades främst åt sena nätter med havsöringfiske i och omkring Göteborg. Westler hade ett par riktigt fina nätter med flera hugg och många upp. Inga riktiga spöböjare ännu, men dom kommer… Orrbeck har besökt Vänern och satt PB på gädda och abborre. En snabbvisit till favoritviken i Vättern har det också blivit men där lös harren, öringen, laxen och rödingen med sin frånvaro. Vi kämpar på med fler turer under sommaren och i augusti rullar vi förhoppningsvis till Dalarna i jakt på harr. Därifrån blir säkert något matigare filmreportage också. I slutet av maj/början av juni åkte Orrbeck till Norge (Molde och Ålesund) i några dagar, ihop med bekanta. Fokus låg inte på fisket denna gången, men ett spinnspö och några skeddrag fick hänga med i packningen. 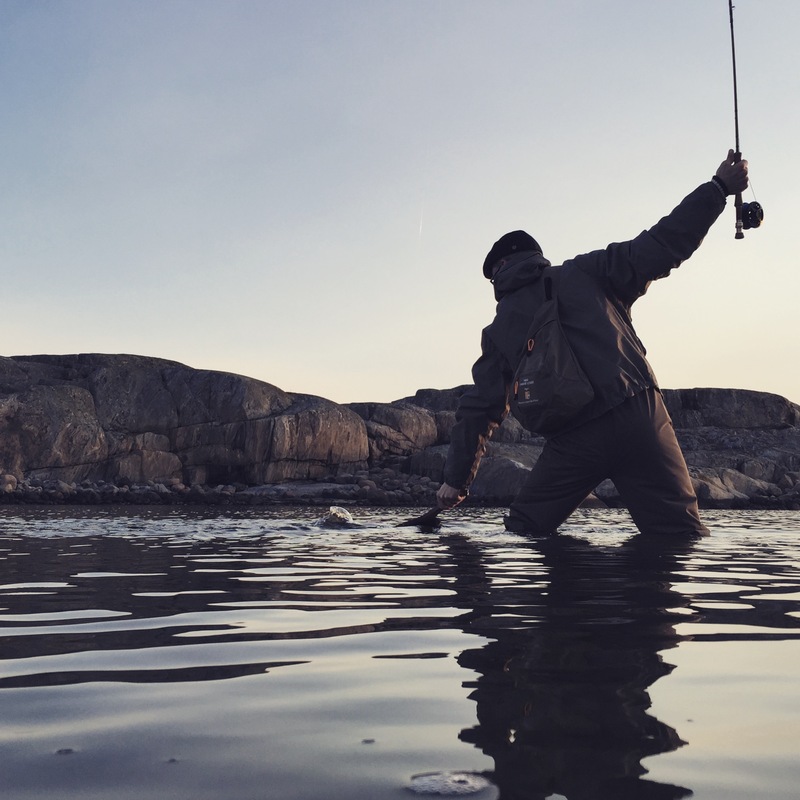 Man har ju hört en del om fisket där… Redan dag två gavs möjlighet till ett par timmars fiske längs klipporna ut mot Atlanten. Det dröjde inte många kast innan spöt böjdes. En sej hade uppskattat mitt silverblå Viking Herring. Sen började huggsexan. Under en period hade både jag och Welander, som var en av deltagarna på resan, hugg på vartannat kast och landade fiskar på vart tredje. Snittet på fångad fisk (mest sej, men också torsk och havsöring) under de timmarna vi fiskade hamnade nånstans runt 2 på 10 kast. De största sejarna låg på mellan 45–50 cm. Det är vi inte bortskämda med längs den svenska västkusten. 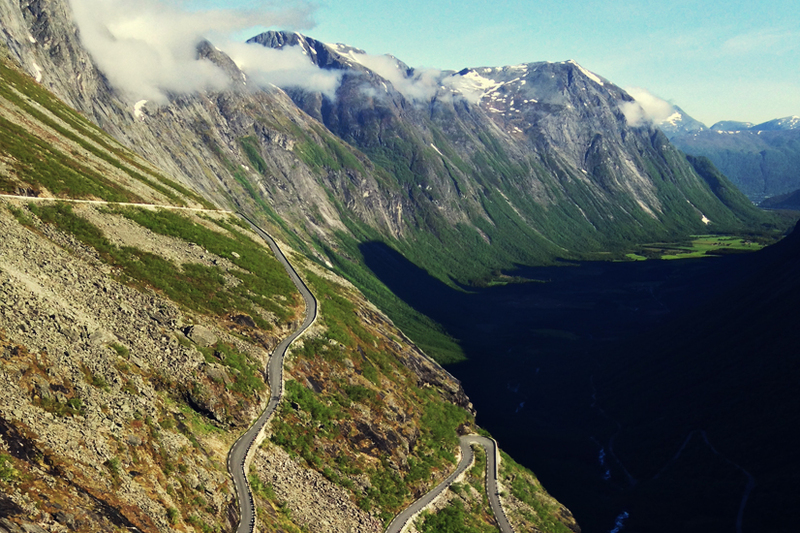 En av dagarna åkte vi på en utflykt längs med delar av Trollstigen, och det var först då man förstod sitt fatala misstag att inte plocka med sig flugfiskeutrustningen. Kristallklara älvar och fjordar i varierande azurblå och smaragdgröna färger. Allt såg väldigt vadarvänligt ut och priserna för att fiska en heldag var inte avskräckande. Nästa resa till Norge kommer samma misstag inte att upprepas. Då gäller rätt spö i rätt land. Nu ser vi fram emot ett par månader av sent kvällsfiske med feta öringar längs den svenska kusten och hoppas på att 45:orna växt till sig ytterligare under maj/juni. Ett av våra favoritställen förra sommaren blev en vik på västra sidan av Hönö. Där tillbringade vi ett antal kvällar med varierande resultat. Några torskar, några gråsejar, några horngäddor, några fjärsingar och ett par öringar. Viken kändes hela tiden som ett hett öringvatten, men vi landade bara några enstaka under hela sommaren. Idag var det dags för nypremiär. 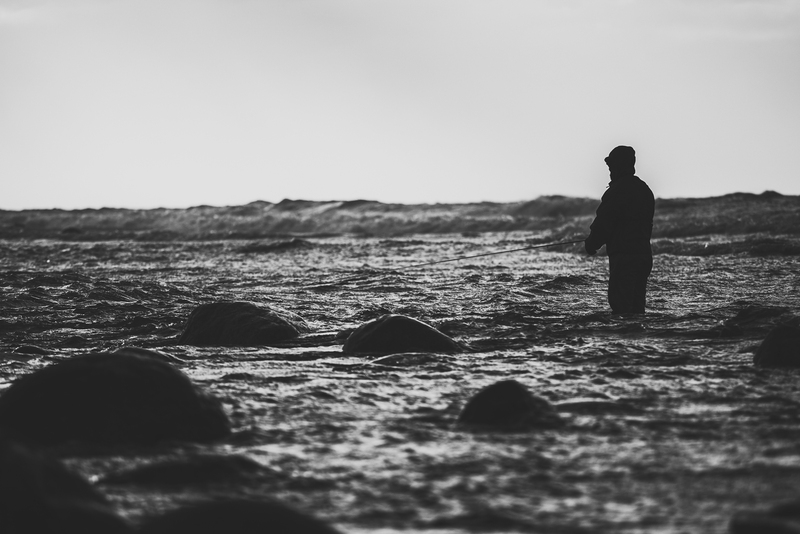 Men istället för viken så föreslog Orrbeck ett sund lite längre norrut på ön. Google Maps antydde ett vatten med stor genomströmning och ett potentiellt öringhak. Orrbeck och Welander anlände runt 15-draget. 15.30 brände det till i Orrbecks tafs men kampen blev kort. Några sekunder efter hugget var öringen long gone och Orrbeck hann bara få en skymt av en blank buk i vattenytan. Det vakade på fint under hela eftermiddagen och Westler, som anlände nån timma senare, fick kontakt ganska omgående. Igen. Och igen. Efter någon timma gick allt som det skulle och Westler lyckades landa sin första godkända havsöring med flugspö. 47 centimeter. En snabb dokumentation och en varsam tillbakasättning följdes av ytterligare ett par hugg under kvällen, men inga fler landade. En fin kväll i Göteborgs yttre skärgård värd att minnas. Ny månad, nytt försök. Trots – eller snarare på grund av – bomrundan i februari packade vi utrustningen för en ny tripp till Lerhamn, Kullaberg. Vädertjänsterna lovade växlande molnighet, 5–7 grader och svaga vindar. Ett halvt av tre rätt. Svaga vindar efter lunch, men molnen låg tjocka ovanför våra huvuden och termometern på torget i Mölle visade 4°C. I sällskap av två flugfiskekollegor från Göteborg matade vi Lerhamnsviken med flugor under åtta timmar. Några få vak och nån som ”eventuellt hade nafs”. Westler lyckades drilla en spigg. Orrbeck tappade hoppet efter lunch och riktade sitt intresse mot fotoväskan där en quadcopter låg redo för avfärd. Nu glömmer vi bomturerna till Skåne och laddar hårt för öringpremiären i Bohuslän om en månad. Därifrån utlovar(!) vi betydligt mycket mer fisk i bild.